Sitting with management at the final review for your customer survey questionnaire someone is going to ask about the incentive for survey completions. It’s a good question but what is the right answer? Here are the most effective customer feedback survey incentives and when you should use them for maximum ROI. Obviously the role of an incentive is to get you more customer feedback survey responses. So the first question is: do you need more customer feedback survey responses? While a 100% response rate would be nice, it’s not practical. On the other hand 0% is not practical either. So what is the minimum you need? In a typically statistical answer; it depends. As few as 5 responses can provide a very good indication of an issue if they are consistent. Where responses are not as consistent the number of responses typically needs to be higher. As a rule of thumb, anything above 10% response rates will yield useful data to drive the change management process. But, especially in a customer feedback scenario, good survey design will often yield effective response rates of this level with no need for an incentive. So you may not need an inventive at all. Making the survey as short as possible: Don’t make it a Christmas tree survey with questions added by everyone in the organisation until it blows out to 15 pages of junk that no-one will ever complete. Do something with the information: If you actually listen to the customer and close the loop with them, and follow up on surveys will have higher response rates. Use a reminder: In our experience a simple reminder a few days after the initial invite will lift response rates by 50%-100%, as much as many incentives. In short yes, incentives do increase the number of responses you will receive for your customer feedback survey. Other research also indicates that, generally, incentives do work to increase response rates, when implemented in the right way. A common fear is whether the incentives will change the response rate by segment or the responses themselves? Research indicates that when used correctly, incentives do not change the reliability of data by respondents. This has been shown in several studies. On the other hand, as part of his research Andrew Cook also found that incentives increase the customer feedback score by 4% across the board. As delivery consistency is the most important aspect of customer feedback design, you should either use an incentive or not. Changing mid-way along will impact on your ability to compare historical scores. So if incentives work and they don’t skew our data too much, which ones are the most effective? There are lots of different types of incentives but they come down to just a few different main variations. Aside: In all of these discussions, I would typically not suggest giving respondents a credit on their account, particularly for business customers .This is not personal or “real” enough to have a substantial impact. A pre-paid incentive is one you give to everyone who receives the invite regardless of whether they respond or not. In on-line surveys, vouchers are often used instead of cash as they are easier to process. While this may seem crazy it can be a very cost effective solution because a pre-paid incentive has a much higher impact on response rate than a promised incentive. Thus you can use a smaller incentive and generate a larger response rate. In this research they found that a pre-paid incentive provides an almost 3 x (59% Vs 22%) increase in response rate. Plus when you total up the overall cost per response it is lower with the pre-paid approach. This may appear strange, where a smaller pre-incentive out performs a larger promised incentive but I believe basic human nature is at play. In his book Influence, Robert Cialdini outlines how significant the driver of reciprocation is in the human psyche. Small gifts can generate enormous obligations in the receiver’s mind. The small “gift” of the pre-paid incentive generates an uninvited debt that can be quickly repaid by recipients through responding to the survey. On the other hand the promised gift is interpreted as a “payment for the service” of responding to the survey. Now the incentive must be much larger and for many senior executive or high income people this calculation of their “hourly wage” will be far below what they perceive to be worthwhile. Thus they will not respond. In fact this may even discourage them from responding. This also leads me to believe that pre-paid incentives may be very effective for those difficult to get senior executive and high income respondents. Although I have no evidence of this. The research here generally indicates that a lottery incentive has about the same impact as a straight payment for the respondent. However, specific tests of lotteries against other types of incentives or no incentives show that lotteries are no more effective in web surveys than in other kinds of surveys: in most tests, lotteries did not significantly increase response rates over a no-incentive or alternative incentive group. In addition lotteries are generally more difficult to administer as they will often require registration and government approval. The regulations can vary depending on country and state making the process complex. Given the choice, a guaranteed incentive is generally the better option. Here the research is stronger and indicates that promised donations to charities have a lower impact than payments or vouchers to the respondent themselves. What I do not have is any research on the effectiveness of pre-paid donations to charity, e.g. : “We have donated $5 to [insert charity] in your name”. Based on the above evidence these may well be very effective for senior executives. The “in your name” part would be important in this case to create the personal reciprocity element. 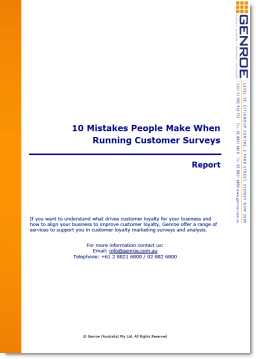 In our experience you do not need an incentive for a properly designed customer feedback (not market research) survey. So before you decide to add an incentive to your next survey follow this checklist and only use an incentive when you really need one. Can I take out any questions? Yes – remove them and start from 1. Have I added a reminder? No — add a reminder and start from 1. Am I acting on the feedback and closing the loop with my customers? No – then start doing something with the feedback and start from 1. Can we use a pre-paid incentive or voucher of some type? No – then go to 7. Can we use a post-paid voucher of some type? No – then go to 8. Can we use a lottery of some type? No – then go to 9. Can we use a donation to charity of some type? Hi Adam — I was wondering if you have an information or experience on whether incentives influence NP score. In other words, if we conduct a customer survey that provides incentives, is it likely to result in a NP score that is higher or lower than a survey that does not provide an incentive. I don’t have any research data on the impact of incentives on outcome scores. I suspect that the impact on score will be as much about how the survey is laid out as anything. For instance what is the easiest or fastest way to finish the survey? If that means you are more likely to click on the high end of the scale it will lift the score, and visa versa. Our experience is that you don’t really need incentives if the survey is well designed, i.e. short and easy to complete. How to incentivize a survey with a giveaway that is intended to be anonymous? I’ve not considered the idea of incentivizing anonymous surveys. I guess it’s still possible but you’d need to provide the incentive with “no strings attached” and I suspect it would be open to high levels of abuse. Thanks for dropping by. You approach sounds effective and I like the “claim you incentive” approach. I think a common sense approach to the potential of incentive abuse is also very useful.